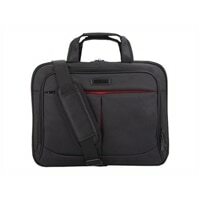 ECO STYLE Pro Tech Topload - Laptop carrying case - 15.6-inch - blackThe Pro Tech Topload is an extremely durable light weight 3 gusset ballistic shoulder bag that will accommodate up to a 15.6" laptop while weighing only 2.3 lbs. Workstation includes cell phone/ accessory pocket, business/ credit card holders and 2 pen holders. Exterior zippered pocket + pass-through allows for attachment to a rolling case. The Pro Tech Topload is an extremely durable light weight 3 gusset ballistic shoulder bag that will accommodate up to a 15.6" laptop while weighing only 2.3 lbs. Workstation includes cell phone/ accessory pocket, business/ credit card holders and 2 pen holders. Exterior zippered pocket + pass-through allows for attachment to a rolling case.